EFFECTIVE December 23, 2010: If you are submitting a language test with your application, the results are now valid for 2 years from the time you took the test, instead of 1 year. This change applies to Federal skilled worker, Canadian Experience Class and Business Class Immigrants (investors, entrepreneurs and self-employed people). If you have some proficiency in both English and French, decide which language you are more comfortable using. This is your first official language. The other is your second official language. You must prove the level of language proficiency you claim on your application. To do this, you must take a language test from an agency designated by Citizenship and Immigration Canada (CIC) before starting the immigration process. NOTE: CIC officers will not hold an interview to assess your language proficiency. CIC will only accept test results from designated language testing agencies. You must submit language test results from a designated testing agency to the CIO with your application. Other evidence in writing will not be accepted as evidence of language proficiency. If you do not submit the results of your official language proficiency test with your application to the CIO, your application will not be processed and will be returned to you as incomplete. To do this, you must take a language proficiency test from an agency designated by CIC before starting the immigration process and submitting your application to the CIO. 2 Submit the assessment results with your application. Do not request that your (IELTS – General Training, CELPIP - General or TEF) language test result be sent directly to the CIO. Submit your original language proficiency test results with your complete application to the CIO. 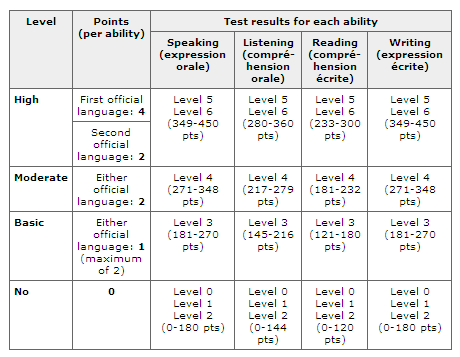 3 Consult the “using your test results” section to determine how many points you will be awarded for your language proficiency. Note: Test results from a designated testing agency will be used as conclusive evidence of your language proficiency. Other evidence in writing will not be accepted as evidence of language proficiency. If you wish to be awarded points for your proficiency in both official languages, include the results of your official English language proficiency (IELTS – General Training or CELPIP – General) and your official French language proficiency test (TEF) with your application. 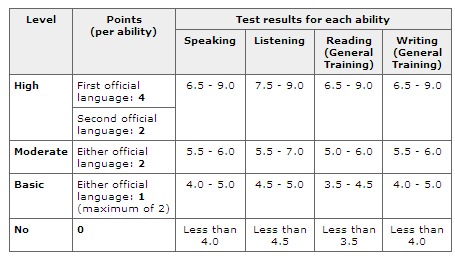 Use your language test results from a designated testing agency, to determine how many points you will be awarded for language proficiency. What is the cost of third-party language testing for applicants? The cost of the International English Language Testing Service, the standard test for English language proficiency, ranges from a low of C$123 in Pakistan to a high of C$265 in Canada. The average price is under C$200. The costs for the Test d’évaluation du français, the standard test for French language proficiency, are similar to those of International English Language Testing Service. Are any applicants exempt from the mandatory language test? What about applicants from English or French speaking countries? Why would someone from England need to take an English test, for example? There are no exceptions to this rule. We want to ensure that all applicants are evaluated against the same standards, no matter what their language of origin, nationality or ethnicity. Each applicant must demonstrate that they meet the minimum language requirements according to their occupational skill level by providing evidence of their abilities in English or French (speaking, reading, listening and writing). All applications must be accompanied by the results of the principal applicant’s English or French language proficiency assessment in order to be considered for processing. ***Language test results must not be older than one year at the time of application. For the purpose of language proficiency, your test result will be matched to the Canadian Language Benchmarks 2000/Niveaux de compétence linguistique canadiens 2006 (CLB/NCLC). CIC uses the CLB/NCLC to determine your language proficiency. Note: There is no Canadian Language Benchmark/Niveaux de compétence linguistique canadien test. The Canadian Language Benchmarks/Niveaux de compétence linguistique canadien are descriptions of language abilities. CIC visa officers use these descriptions to determine your language abilities based results of your English or French language proficiency test. 4 for any one of those abilities, 5 or higher for any other two of those abilities and 6 or higher for the remaining ability. If you do not submit the results of your official language proficiency test with your application to the visa office, your application will not be processed and will be returned to you as incomplete. ***If you have some abilities in both English and French, decide which of the two you are more comfortable using; this will be considered your first official language and will be the one in which your abilities will be assessed against the minimum requirements. To do this, you must take a language proficiency test from an agency designated by CIC before starting the immigration process and submitting your application to the visa office. ***Language Instruction for Newcomers to Canada (LINC) is not a designated testing agency for applicants under the Canadian Experience Class. Submit the assessment results with your application. ***Do not request that your (IELTS-General Training or TEF) language test result be sent directly to the Visa Office. Submit your original language proficiency test results with your complete application. Note: Test results from a designated testing agency will be used as conclusive evidence of your language proficiency. If you wish to be awarded points for your proficiency in both official languages, include the results of your official English language proficiency test (IELTS — General Training) and your official French language proficiency test (TEF) with your application.